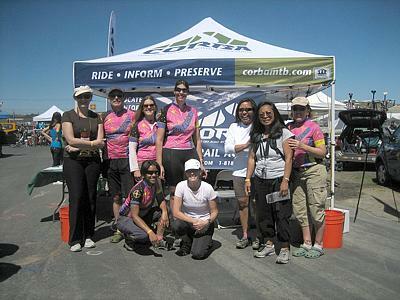 CORBA and Dirtchix members at the CORBA booth at the 2009 Sea Otter Classic biking festival in April. 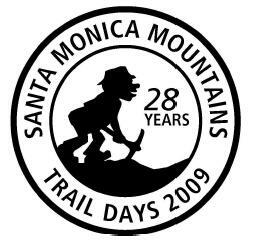 April 24-26 - Santa Monica Mountains Trails Days. Day 1, Saturday: CORBA and other MTB volunteers helped on the Guadalasca and Wood Canyon Vista Trails in Pt. Mugu State Park (Sycamore Canyon). Mountain bikers towed BOB trailers full of CORBA's tools to the work sites. A few signs were installed and poison oak was removed from the top of Guadalasca. CORBA donated some shirts, bells and socks to the evening raffle. Day 2, Sunday: The trails in Pt. Mugu State Park are in overall pretty good shape, so trailwork moved to the Conejo Open Space Conservation Agency (COSCA) Arroyo Conejo area on Sunday. Arroyo Conejo is adjacent to and south of Wildwood Park in Thousand Oaks. CORBA and other volunteers moved boulders to improve some water crossings. CORBA sends a great big Thank-You to all volunteers who helped keep our trails in good condition, whether or not you're CORBA members or even mountain bikers! 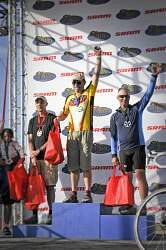 Longtime CORBA member Don Taber won the Men's Mountain Bike XC Race Cat III. Congratulations Don, well done! Returning after winning a medal two years ago in the Women’s Mountain Bike XC Beginner Race, CORBA Board Member Danusia Bennett-Taber competed against a formidable line-up of women riders. Bennett-Taber, placing 11th in her age group, vowed to work hard to earn a place at the winner’s circle next year. Other CORBA members participated in the Sea Otter 20 mile MTB Tour: CORBA Board Member Sonia Ottusch (MBU), Lisa Khort (MBU), Ross Hagopian (MBU), Ruth Walker, Laura Smith, Nora and Nick Alonge (MBU), Belinda Head (DirtChix) and Kimberly Kcofield (DirtChix). CORBA board members Bennett-Taber and Ottusch also promoted CORBA at the 4-day MTB event, manning the CORBA booth prepared by Taber and Bennett-Taber, and answering questions by passersby. Ottusch and Bennett-Taber worked together to advance CORBA’s upcoming Fat Tire Fest (Oct 25) among potential exhibitors and sponsors. The CORBA booth was a popular hangout during the multi-day MTB classic. The Monterey weather for the Sea Otter was uncharacteristically warm with clear skies and a gentle breeze. 'This can’t be the Sea Otter!' 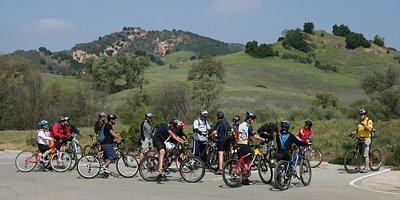 was the constant refrain among returning riders to the mountain biking meet. After the event, nearly all retired to the ubiquitous Monterey fire pit against the area’s famed chilly nights for a night of convivial conversation, a good meal, and high spirits, with laughs and good cheer extending late into the night. You can see more pictures of the event in our photo gallery. Save the date! Sunday, October 25th - CORBA is holding its 22nd annual Fat Tire Fest! We’re shaking, rattling, & rolling the trails. Prepare for our new, exciting XC MTB activities, XC MTB Tours, Kids’ Karrera, Online Auction, Silent Auction Gift Baskets. Meet & Tour Teams, corporate or private, are encouraged to participate. Prizes. Watch for the new 2009 FTF Web Pages! Meeting at LA City Hall for community input into mountain bike access to city parks that was held on April 15: CORBA representatives attended this meeting to give their comments, as did a number of equestrians and Sierra Club leaders who are opposed to off-pavement cycling in the city. We are working to put a summary up on the web site - stay tuned!